• Vertical phototube for micro photography. • Diopter adjustment ring on ocular tube (±5). • Interpupillary distance from 55mm to 75mm. Our in-depth knowledge and industrial expertise enable us to manufacture a distinguished range of Metallurgical Industrial Inspection Microscope. High Resolution HDMI 8 LCD Touch Screen 2.0 MP Camera Wi-FI Enabled. 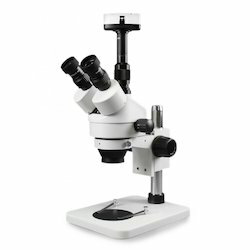 Long working distance microscope with 10x & 20x magnification. Focussing by Rack & Pinion system. In Eyepiece Dioptric adjustment provided, powder coated body. With the features of easy operation, complete functions and economy, it is ideal instrument in geology, petroleum, coal, chemicals and physic fields. It is also widely used in academic demonstration and research. A dual Purpose instrument having Halogen projection bulb workable on 220volts AC mains, magnification upto 200-x. With 24volt 250watt halogen Bulb having graduated scale on screen, co-Axial M-stage, with three objectives 10x, 20x, 45x/40x. Stage : Special vice type mechanical stage to accommodate objects of small diameter. Special replacable attachment is also provided to hold materials like notes, cartons, stamps, finger prints etc. Objective : 4x, 10x and 40x Achromatic. Eyepiece : WF 10x, H15x, H10x Micro & H5x cross. 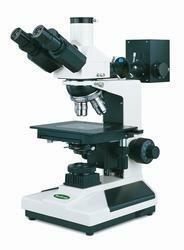 We are offering Industrial Microscope to our client. - Eyepiece PL 10x/23 Br. for.